The Coastal Cactus Wren (campylorhynchus brunneicapillus) is a California Department of Fish and Game species of special concern. The numbers of coastal cactus wren in Orange County have diminished dramatically. Are there coastal cactus wren on the Newport Banning Ranch property? According to the Newport Banning Ranch DEIR, two cactus wren territories were observed during focused surveys for the coastal California Gnatcatcher in spring 2009. A breeding pair had an active nest in a large patch of prickly pear. The first nesting attempt failed, apparently due to an infestation of Argentine ants (Linepithema humile); however, a subsequent nesting attempt produced at least one fledgling. In addition, a solitary male was observed in the northeastern portion of the Project site. Unfortunately, there have been no other recent studies. There is not enough information available to provide a good indication as to how many coastal cactus wren can be found in that area. The Coastal Cactus Wren population has declined in Orange County following the loss of habitat because of development and due to two large wildfires in 2007 and 2008, and other areas of cactus scrub that burned in the mid-1990s. Burn areas have been extremely slow to be re-occupied by Cactus Wren. 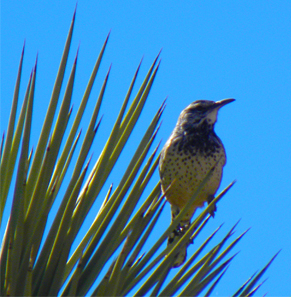 Cactus Wren (as the name implies) live & thrive in undisturbed areas of prickly pear cactus.The proposed development project would impact approximately 3 acres of cactus scrub. According to the Newport Banning Ranch Development DEIR, impacts on this species would be considered potentially significant.